When I first started learning how to cook my favorite dish to make were soups. Let me clarify that, the only item on the menu I was trusted to make with minimal supervision were the soups, or at least that’s what I thought. What I later learned was that working with new ingredients and making classical dishes could be taught, but if you didn’t have that understanding of ingredients and how they worked together, creating new dishes on your own would be almost impossible. You would always be able to re-create, but there was no magic in that. My task was to see what was left over and make a soup out of those ingredients, In fact at one time that’s how soups were always made. That is until they became more in demand, and the need for soup far surpassed the amount of left overs on hand. Restaurants started featuring soups and became well known for their creations, and somewhere along the way, the hearty soups made from left overs fell by the way side, replaced by standardized recipes….sigh. Now I do admit to making most of my soups at school from all new ingredients, but towards the end of the week, as we begin to accumulate leftovers, we go back to the old ways of hearty soups made from what was on hand. 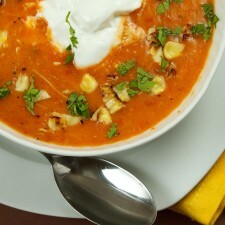 And that my friends, brings us to today’s Roasted Red Pepper Soup with Grilled Chicken and Grilled Corn! I mentioned last month that I had started working with Kelapo to develop new recipes using Coconut Oil. I have to say I’ve been having fun adapting recipes and trying to think outside of the box on ways to use coconut oil in my everyday cooking, and I must admit that Kelapo Coconut Oil has not let me down yet. Today’s recipe was a perfect example! 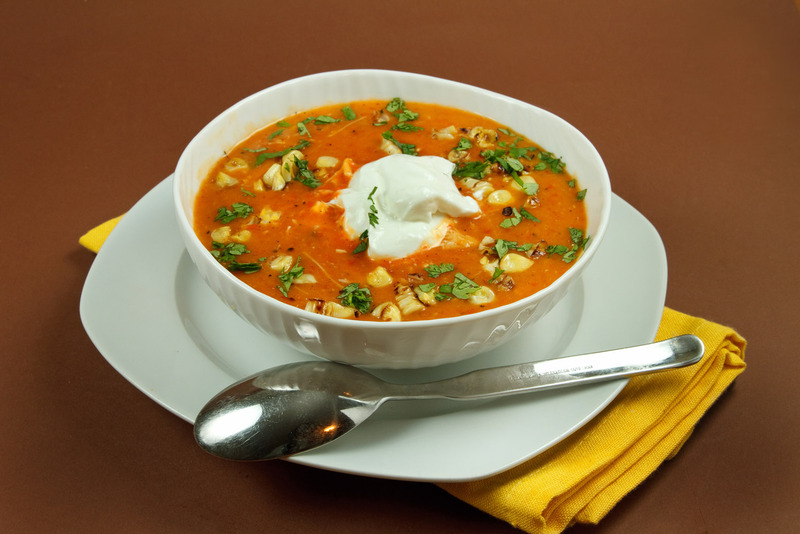 refrigerator to make lunch today I saw too many good leftovers staring at me, begging to be used……and that my friends is how I came up with this incredibly delicious Roasted Red Pepper soup! I used Kelapo Coconut Oil instead of butter to make my roux for this creamy soup, and in keeping with my new found healthy outlook on life (baby steps), I added a dollop of Low Fat Greek Yogurt instead of using Heavy Cream. Now that was a great idea!! 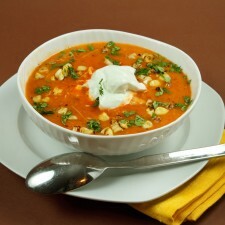 The tang of the Greek yogurt was an amazing addition to the soup and added another layer of flavors! In a small saucepan add the Kelapo coconut oil and allow to become liquid. Add flour and blend in well and reduce heat to low, allow roux to cook for about 5 minutes. Add chicken stock to the roux and allow to simmer for 3-5 minutes on low heat. Add in pureed roasted red peppers, franks buffalo sauce, sugar, and shredded chicken, stir well. Season with sea salt to taste, and if it seems a little bitter add in another teaspoon of sugar. You can either add the corn directly to the soup at this point, or add it to the soup as part of the garnish. 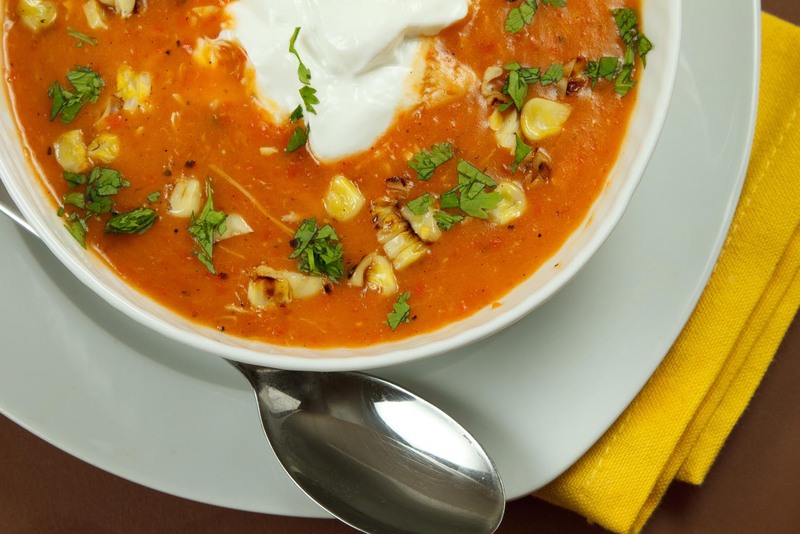 Garnish soup with a dollop of Low Fat Greek Yogurt, Corn and Cilantro. * if the soup becomes too thick, thin it out with a little water or stock. I love it when I amaze myself, the soup was delicious and every bit as good as it would have been using butter, and the Greek Yogurt added more flavor than heavy cream would have. All I needed to make this the perfect lunch would have been a loaf of crusty bread! I’m learning to use Coconut Oil in my every day cooking and I’m having fun doing it. Who knows what’s next……sigh. Thanks to Kelapo, I’m one step closer to healthy eating! How do you use coconut oil in your cooking?